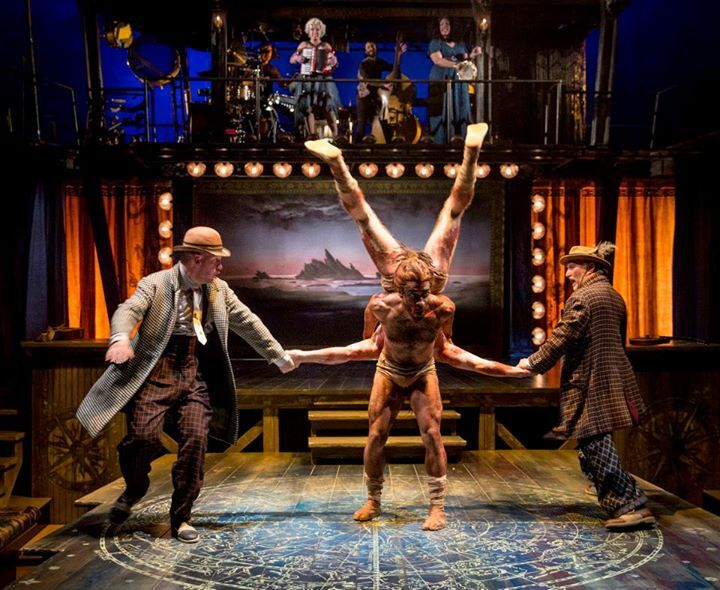 It’s difficult to imagine what the Chicago Shakespeare Theater’s current production of The Tempest would be like without the music of Tom Waits. The production’s playbill features an interview with savvy Shakespeare Adapters/Directors Aaron Posner and Teller (Yes, the self-labeled “quieter” half of Penn and Teller), wherein they discuss a meeting with Waits to attempt to secure the rights to use his music in their production. Vaudevillian and stupefying in its own rite, Waits’s ethereal and distinctive music is a constant presence in the play, hauntingly and beautifully interpreted by vocalists Bethany Thomas and Liz Filios. Their stunning voices are supported by improvised instruments as well as a string bass and percussion featuring celesta-like xylophones. It all comes together to create an eerie-but-not-too-dark mood of wonder. The stagecraft, acting, and raw, physical, acrobatic talent conjure a world that Willard the Wizard could only have imagined, and one that Teller himself has been a part of for a long time – his half-namesake show is currently the longest running production in Las Vegas, after all. The Tempest takes place on a deserted island, so the presence of elaborate stagecraft that conjures the lights and magic of vaudeville and Vegas reveals much about the illusory nature of the play. A good deal of commentary on The Tempest wrestles with the real versus metaphorical interpretation of the wizardry of Prospero. But to my mind, the coincidence of a storm that brings the wizard and his daughter into abrupt contact with his past – via a shipwreck that brings more characters to the island – is a bit too great of a leap without allowing for a touch of the supernatural. 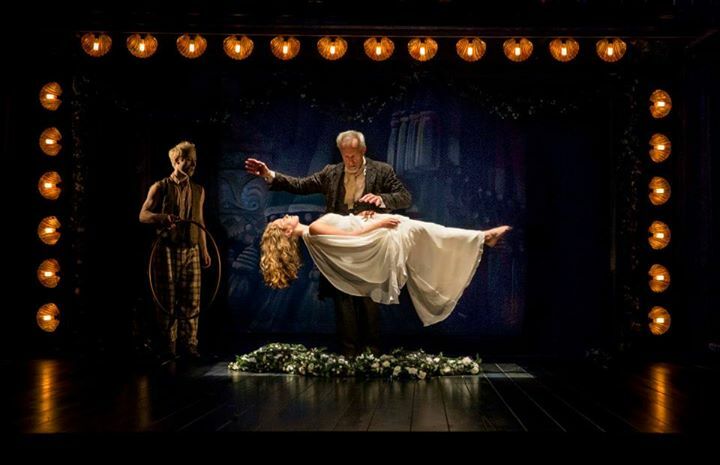 If the storm was indeed conjured by Prospero, it’s clear that with the card tricks and stable of common (though still astonishing) stage magic tricks trotted out for the audience that Posner and Teller’s interpretation is not meant to insinuate reality into Prospero’s tricks. Clearly, in addition to the storm, the titular Tempest is also the unfolding family and political drama that results in a fairy tale ending – Prospero’s daughter Miranda married off happily ever after, a restoration of Prospero’s own Dukedom of Milan, the freeing of his slave spirit Ariel, and the simultaneous forgiving and dispatching of all enemies with no real bloodshed. Most would agree that Shakespeare’s Tempest is light on plot – the directors seized the opportunity to create a performance that is as much spectacle as drama, and Waits’s music adds considerable depth and even poignancy to the spectacle. His lyrics seem tailor made for the production; Posner and Teller make them the centerpiece. One song comes up a few times, a theme of sorts that well-encapsulates the illusory nature of everything about the production. “Everything You Can Think Of” was released on the album “Alice” in 2002, ten years after Waits included the song in the music he wrote for the play by the same title. The production caused a rousing standing ovation and beaming faces on all present – adults and the two ten year-olds seated in front of us alike. If you can make it out to The Tempest at the Chicago Shakespeare Theater by November 8 you will not be disappointed.